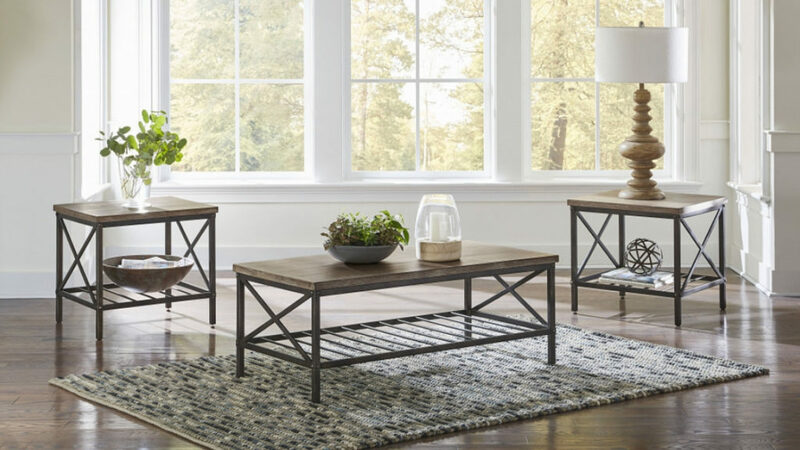 Upgrade your living room with three matching pieces like a rustic coffee table set. The Brendon Occasional Collection from American Freight Furniture and Mattress features three tables with metal frames and distressed wood tabletops. Add hints of outdoor colors and textures to your living room in a sophisticated way. This week, we’re all over the rustic interior design trend. We love the Brendon set because it’s simple and beautiful. You’ll have no trouble incorporating this coffee table and end table set into your neutral, industrial, colorful, or traditional living room theme. What do you want to know about this rustic coffee table set? Keep reading to get all your questions answered. The Brendon Occasional Collection features one rectangular coffee table and two identical square side tables. 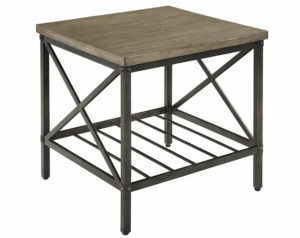 The base of each table features a two-tiered dark metal framework. Thin metal bars in a ladder pattern create the bottom tier, and “X” bars add a decorative design to the sides of all three tables connecting the top to the bottom tier. The tabletops feature a distressed wood in a medium brown finish. The metal bases and wood tops complement each other perfectly. Here are the measurements for each table in this 3-piece coffee table set: Coffee table Length 48″ x Width 24″ x Height 18″ End Table Length 22″ x Width 22″ x Height 24″. 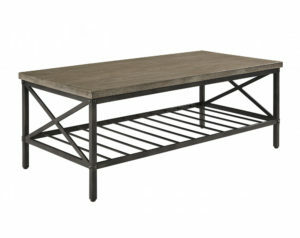 For chaises or oversized accent chairs and ottomans, you can use the Brendon coffee table as an extra long side table. Simply stage the table long ways next to the chair or chaise. You can stage the pieces on an angle to add drama to the room. Use the end tables to prop table lamps near your sofa. Create a symmetrical statement area in your living room with help from the Brendon end tables. Take a tall accent chair like a Wingback style and place an end table on either side of the chair. Hang a tiny suspended light fixture above either end table to create a modern reading nook. Or play around with stacks of books on the tables to create a nearly-symmetrical look. Use the coffee table in another area of the room across from a sofa or loveseat. Make a “U” shaped living room setup with one sofa, two chairs, and the Brendon Occasional Collection. Center the sofa where you’d like it and add an end table on either side. Place a chair on either side of the end tables facing inward to create the sides of the “U” shape. Add the coffee table across from the sofa or use it in another sitting area in your home. There’s more staging inspiration where that came from! For more tips about decorating and furnishing your living room, click here. The modern Brendon Occasional Collection can be yours for only $299. That’s three tables for less than $300! Stop by your local American Freight Furniture and Mattress to shop all of our latest styles. From rustic coffee tables to more traditional shapes and colors, there’s something for everyone at American Freight. Click here to view our store search page and find the location nearest you. What’s the Scoop on the Blog? Stay up-to-date on all the latest blog content. 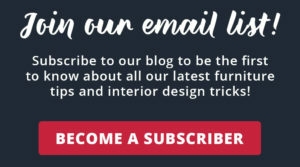 Get the latest posts, interior design tips, and other exclusive offers directly to your inbox. Subscribe today! Click the image below to get started.